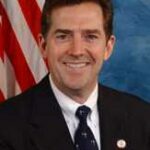 James Warren "Jim" DeMint is an American politician who was a United States Senator from South Carolina from 2005 to 2013. He is a member of the Republican Party and a leading figure in the Tea Party movement. Hillsdale College President Larry P. Arnn and Heritage Foundation President Jim DeMint sat down to discuss Senator DeMint’s new book, Falling in Love With America Again, at the College’s Kirby Center in Washington, D.C., on April 21, 2014. The following is an excerpt from that book. So long as there are only two ways to get ahead—the legitimate way, which leads to earned success, and the illegitimate way, which leads to unearned success or, if things go wrong, to jail—the system of freedom and responsibility we call democratic capitalism works very well. This goes for institutions large and small, and for people powerful and weak. The rules for all of us start with the law and, ultimately, the U.S. Constitution. One of the problems of Big—a Big is an organization that has reached such a size that its continued existence and success is no longer contingent upon its quality of service; this dubious distinction finds its highest manifestation in our bloated government—is that it creates a third option: neither obeying the rules nor breaking the rules, but changing the rules as you go. That’s what happens in cronyism, which is in effect legal cheating. Emphasis on the legal. That is one of the most frustrating aspects of the crisis of Big: Most of the time there is no crime to prosecute. The institutions change the rules, so what would have been cheating, and what many people see as cheating, is actually blessed by the state. The transactions of crony capitalism—campaign contributions on the one side, policy changes on the other—are all perfectly legal. This is why so much of the criticism of special interests as such is incomplete, or even misdirected. Attacking special interests for accepting government favors is like criticizing a four-year-old for eating ice cream for breakfast. The proper targets of criticism are not the beneficiaries of the bad policy, but those in charge who acquiesce to their requests—the government agencies that provide the favors; the parents who allow their kids to eat whatever they want. When government officials change policies to benefit special interests, the responsibility for the “cheating” lies with the officials, not the special interests. They, after all, are only playing by the rules the government sets. As long as politicians effectively put the rules of the game up for sale, it’s hard to fault people for trying to buy or rent them.
. . . Despite all the promises you hear from politicians, big government does not really help the little guy. Big government fosters big business, big unions, and big costs to taxpayers. Big government and its big partners rob individuals and our nation of freedom, opportunity, and prosperity.